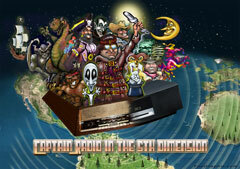 Greetings, Audionauts – Captain Radio here with a review of Super Indian. The Super Indian brand origins are as unique as those of the super dude himself. For starters, Super Indian has triple citizenship! Actor, musician, and comics artist Arigon Starr was tossing about project ideas with Indigenous Theater Workshop mates on a 2006 train ride out of Brisbane, Australia, when she unexpectedly conceived Super Indian to fill a Native-American gap in the super hero pantheon. While Starr returned to flesh out her concept in Los Angeles, two of those mates, Jean Bruce Scott and Randy Reinholz of Native Voices at the Autry, allied with Shirley Sneve of the Native Radio Theater Project to commission an audio script from Arigon featuring her new superhero. Super Indian emerged as a “hit” production at the 2006 National Audio Theater Festival, and Starr was asked to adapt the original script into a series of ten five-minute episodes. Then a cast of mostly Native-America talent, led by William Dufris as Director and Tony Palermo as Sound Designer, performed the adaptations live in one evening before a packed Wells Fargo Theater at the Autry National Center in Los Angeles. Native Voice One Radio Service and the American Indian Radio on Satellite thereafter aired these episodes nationally. With commission funding concluded, Starr plans to fund six new episodes awaiting production by re-launching her web site, superindiancomics.com, next Monday, April 11th. New online Super Indian comics, free for viewing, will be updated weekly thereafter. Visitors can also purchase gifts from the online store to help underwrite the new audio production. … justly earns its fans and the continuing right to delight. Listen to Super Indian audio episodes at PRX.org, and read Super Indian Comics at superindiancomics.com. Click on Merchandise at the latter web site to visit the Leaning Oak reservation store where your wampum is welcome, and you can help out Super Indian. All commodities guaranteed 100% Rezium-free. Even the cheese. Captain Radio Reviews Super Indian From Wacky Productions Unlimited!